GPSSB Recruitment 2018 Job alert both Fresher and Experienced can get updated on 28-08-2018 notification on recent Gujarat Panchayat Service Selection Board recruitment 2018 openings @ Gujarat . This is an exclusive page updated on 28-08-2018 for the latest recruitment notification ojas.gujarat.gov.in from GPSSB 2018 it contains both active and recently expired Job openings and recruitment notification from GPSSB 2018. 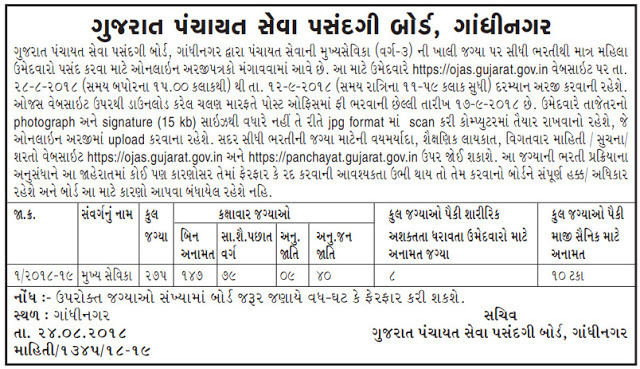 Interested Job Aspirants who are ready to apply for Gujarat Panchayat Service Selection Board 2018 Notification must possess the below-given Eligibility Details. Selected candidates will get RS.31,340/- (Per Month) by the Recruiting Organization.